Held: The evidence presented shows that, contrary to the revenue agent's analysis, PH repaid to DH during 2003 more than the amount the revenue agent determined PH to have misappropriated from DH in that year. [Legally this had the effect of eliminating the taxable income. Held, further, the purposes of the doctrine of collateral estoppel do not support its application to uphold whatever minimum deficiency would be consistent with PH's conviction for tax evasion. Held, further, because Ps are not liable for any deficiency in their Federal income tax for 2003, the fraud penalty R asserts against PH and the accuracy-related penalty R asserts against PW are not sustained. I focus here, as did the Tax Court, on the plea agreement to the count of tax evasion for the 2003 year. As I note toward the end of this blog entry, the criminal information to which the plea was entered had a "a separate count under section 7214(a)(7) (making or signing of fraudulent return by officer or employee of United States), that Mr. Senyszyn prepared and filed a fraudulent return on behalf of Mr. Hook's corporation, Modern Method Development, Inc. (MMDI)." The Tax Court's opinion does not mention that count further and, instead, focuses on only the tax evasion count. So, for the main discussion in the case and in this blog, § 7214(a)(7) appears irrelevant. stipulate at sentencing: "BOHDAN SENYSZYN knowingly and willfully did not include about $252,726.00 in additional taxable income that he acquired in 2003." In exchange for Mr. Senyszyn's agreement to plead guilty, the U.S. attorney dropped charges against Mrs. Senyszyn. On September 20, 2007, Mr. Senyszyn entered a plea of guilty in accordance with his agreement with the U.S. attorney. Although he subsequently moved to withdraw his guilty plea to the count of tax evasion, the U.S. District Court for the District of New Jersey denied the motion and, on February 25, 2008, it entered judgment pursuant to the plea. Mr. Senyszyn appealed the denial of his motion to withdraw his guilty plea, and the U.S. Court of Appeals for the Third Circuit affirmed the denial. See United States v. Senyszyn, 338 F. App'x 201 (3d Cir. 2009). Mr. Senyszyn filed a motion to vacate, set aside, or correct his sentence, and that motion was denied, as well. See Senyszyn v. United States, No. 2:09-cv-6120, 2010 WL 2483541 (D.N.J. June 4, 2010) (order denying motion). He did not file a direct appeal of his criminal sentence, and his conviction has become final. After the plea, the husband and wife then filed an amended joint return for 2003 wherein they reported the correct income figures, including most of the income that was the subject of the plea agreement but claiming payments of amounts in the year 2003 that would offset the income (and more). 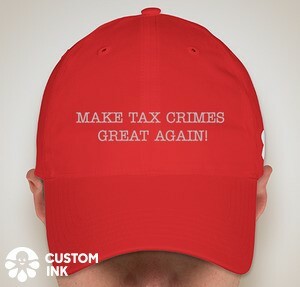 There is no detail provided as to how the taxpayer or the agent involved in calculating the numbers for the criminal investigation (who testified in the Tax Court trial) failed to identify the offsets, thus eliminating the tax that was an element of the crime of tax evasion. As to the issue of whether there was a deficiency and the amount of the deficiency, the issue turned upon whether the defendants were entitled to an offset in 2003 to the amount of unreported taxable income claimed by the IRS. The Tax Court held that, on the record, the taxpayers had proved that husband had returned at least an amount necessary to offset the income claimed by the IRS. Therefore, the Court held, there was no deficiency to determine in the case. Although the existence of some tax deficiency is a necessary element of the offense described in section 7201, prior cases do not establish a minimum amount necessary to support a conviction. Some U.S. Courts of Appeals have suggested that section 7201 requires a "substantial" deficiency. E.g., United States v. McKee, 506 F.3d 225, 235-236 (3d Cir. 2007) (holding that, while "the government need not allege or prove the precise amount of additional tax due and owning" to support a charge of tax evasion under section 7201, the evidence must "establish a substantial tax deficiency"); United States v. Mounkes, 204 F.3d 1024, 1028 (10th Cir. 2000) ("To establish th[e] offense [described in section 7201], the government must prove * * * the existence of a substantial tax liability[. ]"); United States v. Wilson, 118 F.3d 228, 236 (4th Cir. 1997) (listing "a substantial tax deficiency" among the elements of a violation of section 7201); Heasley v. United States, 218 F.2d 86, 90 (8th Cir. 1955) ("[T]he offense here is not one requiring exact proof as to the amount of net income evaded but whether or not the defendant attempted to evade a substantial amount of net income tax."). But see United States v. Daniels, 387 F.3d 636, 641 (7th Cir. 2004) ("We take this opportunity to clarify the law in this Circuit: the government need not charge a substantial tax deficiency to indict or convict under 26 U.S.C. § 7201."). Despite some courts' references to a "substantiality" requirement, we have found no case in which a defendant avoided conviction because the determined deficiency was too small. See id. at 641 n.2 ("Defendants conceded at oral argument that no court has held that an insubstantial tax deficiency is not punishable under 26 U.S.C. § 7201. "); see also United States v. Cunningham, 72x3 F.2d 217, 231 (2d Cir. 1983) ("While it is true that at some point a court may as a matter of law find that the liability avoided was insubstantial, the threshold is a low one[.]"). n6 Mr. Senyszyn did not explain why he agreed to the stipulation of unreported income for 2003 as part of his plea agreement if, in fact, he repaid to Mr. Hook during that year more than he took. Our puzzlement over his motives, however, does not prevent us from concluding, on the basis of a preponderance of the evidence presented to us, that Agent DeGrazio erred in his analysis and that Mr. Senyszyn, at least during 2003, repaid to Mr. Hook more than he misappropriated. n7 For purposes of our analysis, we have accepted that the conditions of collateral estoppel are present despite the existence of alternative grounds for Mr. Senyszyn's conviction under sec. 7201. Mr. Senyszyn's preparation and filing of a fraudulent return on behalf of MMDI were themselves sufficient grounds to justify his conviction for tax evasion. Although the existence of an underpayment is a necessary element of the offense described in sec. 7201, Sansone v. United States, 380 U.S. 343, 351 (1965), the deficiency need not be that of the defendant, e.g., United States v. Wilson, 118 F.3d 228 (4th Cir. 1997) (evidence of defendant-attorney's efforts to assist client in concealing assets from IRS sufficient to support conviction under sec. 7201). Because Mr. Senyszyn's conviction under sec. 7201 was justified by his preparation and filing of a fraudulent return on behalf of MMDI, the determination that, in addition, he omitted income from his own return could be viewed as having been unnecessary to the conclusion reached in his criminal case. See, e.g., Restatement, Judgments 2d, sec. 27, cmt. i (1982) ("If a judgment of a court of first instance is based on determinations of two issues, either of which standing independently would be sufficient to support the result, the judgment is not conclusive with respect to either issue standing alone."). The U.S. Court of Appeals for the Third Circuit, however, to which appeal of the present case would lie absent a stipulation to the contrary, see sec. 7482(b)(1)(A), has rejected the position of the Second Restatement and decided to "follow the traditional view that independently sufficient alternative findings should be given preclusive effect", Jean Alexander Cosmetics, Inc. v. L'Oreal USA, Inc., 458 F.3d 244, 255 (3d Cir. 2006). Even if we disagreed with the Court of Appeals, we would under Golsen v. Commissioner, 54 T.C. 742, 757 (1970), aff'd, 445 F.2d 985 (10th Cir. 1971), apply in the present case the traditional view that, when a prior judgment is based on alternative grounds, each is given preclusive effect against the parties or their privies. 1. There are a lot of unanswered questions in the opinion. One is why the husband plead guilty to tax evasion when there was no tax due. (See the Tax Court's footnote 6 above.) The husband had been an IRS revenue agent at the time of the alleged criminal conduct in issue. Presumably, he would have had the facts that would show no tax due. The husband did try unsuccessfully to avoid the plea to tax evasion on the ground that no tax was due, but that does not explain why he entered the plea agreement in the first case. United States v. Senyszyn, 338 Fed. Appx. 201 (3d Cir. 2009)(nonprecedential), here. Perhaps, the husband felt that it was worth an erroneous plea to avoid the other significant counts in the superseding indictment that the Government dismissed by omitting them from the information to which the husband pled. 2. Equally troubling, there is no explanation for how IRS CI missed the offset in the criminal investigation. Presumably a good follow-the-money investigation would have turned up the offsets. 3. Had the Government realized the lack of evaded tax, it could likely have charged tax perjury for the husband did fail to report the amount received and the offset in 2003. But without tax evaded, the Sentencing Guidelines would indicate a minimal sentencing range, if any, although there were sufficient other charges to obtain a sentence. Of course, there were other crimes charged and that could have been charged, so the sentencing needs of the case probably could have been met in some other way than a tax evasion conviction for 2003. 4. In this regard, the Tax Court's opinion does indicate that he pled to one count of § 7214(a)(7), here, apparently related to his 2003 return and to a return he filed for Modern Method Trust. That section provides in relevant part a felony crime for an officer or employee of the United States filing a false return. If, indeed, that plea related at least in part to the trust's taxes, presumably, the husband could also have been charged with and convicted of Aiding and Assisting, § 7206(2), here. 5. Also troubling is why the Government insisted in in the deficiency case on collecting a tax that the evidence appeared to show was not due. 6. Praises to Judge Halpern for digging into this one and getting the right result. 7. Finally, although Judge Halpern could at least fix the deficiency issue, this may not be available after the enactment of the recent provisions denying a taxpayer the right to contest tax restitution awarded by the sentencing court. Those provisions were enacted in 2010. See What Can Be Done If Tax Restitution Exceeds the Tax Due (Federal Tax Crimes Blog 9/2/13), here; Tax Restitution and Doubt As to Amount (Federal Tax Crimes Blog 7/10/13), here; Restitution in Tax Cases (Federal Tax Crimes Blog 9/22/12), here; and New Statute for Civil Effect of Restitution in Tax Cases (Federal Tax Crimes Blog 2/11/11), here. Judicial Estoppel of Tax Liability Based on Plea Agreement (Federal Tax Crimes Blog 9/20/14), here.